Three big banks suffered technical glitches Friday that prevented customers from using their debit and credit cards. 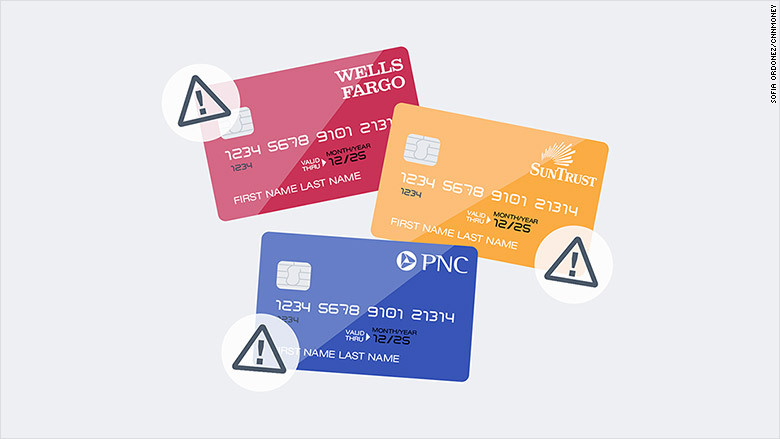 PNC Bank and SunTrust (STI) reported issues that affected some debit and credit card transactions, and some Wells Fargo (WFC) customers weren't able to use their credit cards or access their online account. All three said they had restored service later Friday. PNC said its problem stemmed from a service vendor technical issue that also prevented access to online and mobile banking. A PNC spokesperson said the problems started around 6 a.m. ET and were resolved before 11 a.m. Customers were able to access their money from an ATM throughout the online outage. Wells Fargo said a "technical issue" had made it hard for some credit card customers to make purchases or access their accounts. "That issue was resolved and customers can now use their card normally," the bank said. USAA, a financial services provider for military members and their families, also had issues in the morning with some credit card transactions not going through due to problems with a third-party processor.